One of the hallmarks of education is to build students’ emotional, psychological and physical resilience (Booth 2015; Haggerty et al. 1996). However, all available indicators suggest what we are doing does not appear to be universally effective (Black Dog Institute 2016; Haidt and Paresky 2019). Rates of mental illness, anxiety, depression, and a myriad of other health issues such as ADHD, obesity and diabetes are rising (Gray 2018a, b; Henley 2010). These modern maladies are in part, linked with our inactive and nature-estranged lifestyles (Kellert and Wilson 1993; Maller and Townsend 2006; Selhub and Logan 2012). Correspondingly, Louv (2011) states that children are suffering from what is commonly referred to as Vitamin N (N for Nature) deficiency. Recent provocations by Braus and Milligan-Toffler (2018) and Truong and colleagues (Truong et al. 2018) carry this viewpoint to further magnitude. American Psychological Association (2010). The road to resilience. Retrieved from http://www.apa.org/helpcenter/road-resilience.aspx. Australian Curriculum, Assessment and Reporting Authority (ACARA) (2017). Curriculum Connections: Outdoor Learning. Retrieved from https://www.australiancurriculum.edu.au/resources/curriculum-connections/portfolios/outdoor-learning/?searchTerm=outdoor+learning#dimension-content. Black Dog Institute (2016). Mission Australia Youth Mental Health Report 2012–2016. https://blackdoginstitute.org.au/docs/default-source/research/evidence-and-policy-section/2017-youth-mental-health-report_mission-australia-and-black-dog-institute.pdf?sfvrsn=6. Dickson, T., Gray, T. & Mann, K (2008). Australian Outdoor Adventure Activity Benefits Catalogue https://webcache.googleusercontent.com/search?q=cache:MlcPtL33910J:https://outdoorsvictoria.org.au/resources/australian-outdoor-adventure-activity-benefits-catalogue/+&cd=1&hl=en&ct=clnk&gl=au&client=safari. Ewing, R. (2018). Exploding some of the myths about learning to read: A review of research on the role of phonics. ISBN 978-0-6482555-6-7 Retrieved from https://www.alea.edu.au/documents/item/1869. Gray, T. (1997). The impact of an extended stay outdoor education school program upon adolescent participants. (Doctoral Dissertation). Wollongong, Australia: University of Wollongong. Retrieved from http://ro.uow.edu.au/theses/1799. Gray, T (2018a). Being in nature is good for learning, here's how to get kids off screens and outside. The Conversation. Retrieved from http://theconversation.com/being-in-nature-is-good-for-learning-heres-how-to-get-kids-off-screens-and-outside-104935. Gray, T. (2018b). Outdoor learning: Not new, just newly important. Curriculum perspectives. https://doi.org/10.1007/s41297-018-0054-x. Gray, T., Truong, S., Reid, C., Ward, K., Singh, M. & Jacobs, M. (2018). Vertical Schools and Green Space: Canvassing the Literature. Western Sydney University. https://doi.org/10.26183/5bd93af6a3ca5. Haidt, J. & Paresky, P. (2019). By mollycoddling our children, we're fuelling mental illness in teenagers. https://www.theguardian.com/commentisfree/2019/jan/10/by-mollycoddling-our-children-were-fuelling-mental-illness-in-teenagers?CMP=fb_gu&fbclid=IwAR1PhsqsxrXiYIXcFnT9BOtXtK37AKOJE0-V7XO-zCQojCsSFSyAev6Tp04 (Accessed January 28, 2019). Henley, J. (2010). Why our children need to get outside and engage with nature. The Guardian, https://www.theguardian.com/lifeandstyle/2010/aug/16/childre-nature-outside-play-health Accessed 23 July, 2018. Neill, J. T. (2008). Enhancing life effectiveness: The impacts of outdoor education programs. (Unpublished doctoral dissertation), Faculty of Education, University of Western Sydney, NSW, Australia. Retrieved from http://wilderdom.com/wiki/Neill_2008_Enhancing_life_effectiveness:_The_impacts_of_outdoor_education_programs. Neill, J. T., & Heubeck, B. (1998). Adolescent coping styles and outdoor education: Searching for the mechanisms of change. In. Exploring the boundaries of adventure therapy: International perspectives. Proceedings of the International Adventure Therapy Conference (1st, Perth, Australia, July 1997). Retrieved from: http://files.eric.ed.gov/fulltext/ED424067.pdf. Neilson, T. & Hansen, K. (2007). Do green areas affect health? Results from a Danish survey on the use of green areas and health indicators. Health and Place, 13(4) 839-850. https://doi.org/10.1016/j.healthplace.2007.02.001. Scott, M. (2017). Preparing today’s students for tomorrow’s world. Speech delivered at the Trans Tasman Business Circle, 29 June, 2017. Retrieved From: https://education.nsw.gov.au/our-priorities/innovate-for-the-future/education-for-a-changing-world/thoughts-on-the-future/preparing-todays-students-for-tomorrows-world#The3 . Accessed January 28, 2019. Shellman, A. (2009). Empowerment and resilience: A multi-method approach to understanding processes and outcomes of adventure education program experiences. (Unpublished doctoral dissertation). Indiana University, Indiana, MI, USA. Retrieved from http://gradworks.umi.com/33/54/3354905.html. Truong, S., Singh, M., Reid, C., Gray, T., & Ward, K. (2018). Vertical schooling and learning transformations in curriculum research: Points and counterpoints in outdoor education and sustainability. 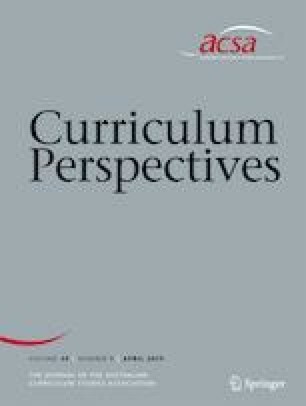 Curriculum Perspectives. https://rdcu.be/5RhP. Wilson, E. O. (2015). E.O. Wilson Explains Why Parks and Nature are Really Good for Your Brain. The Washington Post. Retrieved From: Http://Www.Childrenandnature.Org/2015 /10/01/E-O-Wilson- Explains-Why-Parks-And-Nature-Are-Really-Good-For-Your-Brain/.